Germany's central bank, headquartered in Frankfurt, is independent of the government. The Bundesbank - jointly with the ECB - issues Euro notes, acts as clearing house and bank supervisor and manages currency reserves. Unlike the US Federal Reserve, for example, it is not officially responsible for maintaining the stability of the financial system and is not a lender of last resort. Jens Weidmann is the current Bundesbank president, he took office in 2011, becoming the youngest person ever to take up the job. This is a collection of DW's latest content concerning the Bundesbank. Tensions are rife as the finance ministers of the G20 meet in Indonesia. 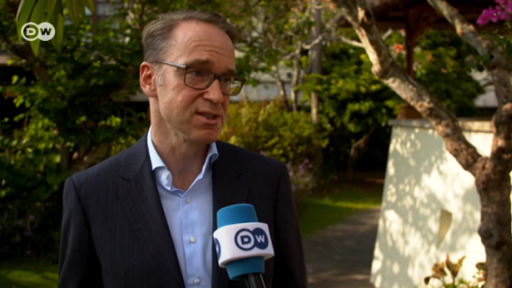 In an interview for DW, the head of the German central bank, Jens Weidmann, urged leaders to make every effort to avoid a full-blown trade war. Bitcoin is on everyone's lips, but in Germany there is a once mighty currency that you can actually put your hands on — just don't try paying with it. Why are 12 billion Deutsche Marks still in circulation? Germany's central bank earned €2 billion more than it spent last year, doubling its profit compared with the previous year and contributing a nice windfall to the government budget after a meagre 2016. A German media report has said Italy and France would be against appointing German central bank chief Jens Weidmann head of the ECB in 2019, when Mario Draghi's turn expires. Much ado about nothing? A decade ago, the subprime crisis began in the US, which a year later became a global financial crisis with the failure of Lehman Brothers. DW explores what politicians and the financial world have learned. Critics of the ECB's lax monetary policy have submitted an urgent motion to Germany's Supreme Court. They demand that the country's central bank immediately exit the ECB's huge bond-buying program. A combination of low interest rates and banks hunting for yields could fuel a dangerous real estate bubble, a senior member of the German central bank has warned, urging banks and financial supervisors to be alert. Germany's central bank has posted only a small distributable profit for 2016 - at least it's a lot smaller than what the finance minister has hoped for. Increased risk provisions were one factor behind the drop. The Bundesbank has singled out seven cities where property prices were particularly overvalued. Investors have turned to real estate as consistently low interest rates negate any benefits from saving. The recent introduction of new security features in some euro banknotes has led to a significant drop in the number of counterfeit bills. But there's more work to be done, the German central bank says. Hans Tietmeyer held a major leadership role in two of Germany's most important transitions in recent memory: Reunification and the introduction of the euro currency. His passing has been confirmed by the central bank. The head of Germany's central bank, Jens Weidmann, has said the planned state-funded rescue of Italian lender Monte dei Paschi needs to be analyzed very carefully. He fears the scheme may not comply with new EU rules. Germany's top banker says London would lose EU-wide banking rights if it abandons free trade with the EU. But he warns the bloc against deepening integration in response to Brexit. Germany's central bank has come out in favor of reducing the overall tax burden for Germans in light of a continuously robust labor market and annual balanced budgets. But it also urged a less popular change.